Growing tomatoes in containers is almost always an adventure. It can be incredibly rewarding or flat out disastrous. Sometimes epic failure can happen for reasons beyond your control like tomato blight or a ridiculously wet or cold summer. 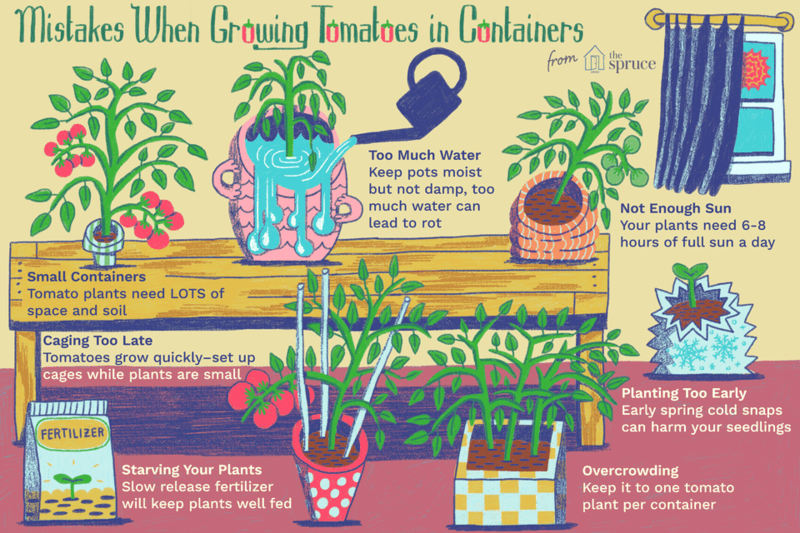 But there are some common mistakes (trust me, I've made all of them, much more than once) that if you can avoid them, will vastly increase your chances of growing tomatoes in containers successfully. When it comes to tomato containers, bigger is better. The bigger your container, the more soil it will hold. The more soil you have, the better the soil holds water. Also, the more soil the more available nutrients for your plants. Consistent water and food are two of the most critical elements for happy, healthy tomato plants and large harvests. Watering your tomato plants properly is probably the main key to tomato success. Too much water and the plants drown, too little and you get blossom end rot. Inconsistent watering will also get you blossom end rot, split tomatoes, and stressed plants. So here's a critical thing you must do for tomato success (and the most difficult if you are using conventional pots instead of self-watering). You want to keep the soil in your pots consistently moist - not wet, but damp. Before you water, check if your soil is already moist. To do this put your finger into the soil about an inch or two (a good way to do this is going to your second knuckle). Add water if the soil feels dry to the touch at your fingertip. Don't forget drainage too. Make sure your pot has large holes in the bottom so excess water can drain out. Pot feet are also a good idea if you have your pot on a patio or non-porous surface. Add water until it drains out the bottom of your pot. That way you will know that all of the roots, even those at the bottom of the pot, have gotten watered. Another great way to control water to your containers is to use a self-watering container, such as a grow box. I've had great success with Earthbox and The Grow Box brands. The amount of water your tomato plant needs will depend on a few things including the weather. The Wind, heat, humidity, the size of your pot and the kind of potting soil you use will affect how often you need to water. By mid-season, a large tomato plant may need watering at least once a day - sometimes twice. Also, when you water, make sure to really soak your plants – if you just give them a sip, the water will only wet the top layer of soil. When you water, try to water the soil directly, not the leaves, because wet leaves can lead to fungus. Don't bother with water crystals they are expensive and tests have shown that they aren't particularly effective. Putting lots of plants in one pot may seem like a good idea, but it usually is counterproductive. Unless my pot is tremendous (more like a raised bed) I only put one tomato plant per pot. To get an idea of minimum size, I have successfully grown one huge tomato plant in a large reusable grocery bag and that's about as small as I'd go per plant. Tomatoes are sun lovers and need full sun - which means that they need unobstructed, direct sunlight for 6-8 hours a day - no cheating or skipping. Many people (myself included) chronically overestimate how much sun an area gets. Really figure this out - either with a watch or a sunlight meter - before you plant up your pots. Also, the amount of that hits a spot can change dramatically over the growing season, so check every week or so to make sure there are no obstructions blocking the sun. Along with the sun, tomatoes like warm temperatures. While it might feel like you're getting a jump on the season by putting your tomatoes out early, they will not really do anything until it is consistently warm. If you do want to get a jump on the season, you can either cover your tomatoes with clothes, or plastic when it's cold or do what I generally do which is to put them on carts and wagons and haul them in and out of my garage until temperatures warm up. Also, don't forget to harden off your seedlings. Tomatoes are heavy feeders and need to be fertilized if you aren't using a pre-fertilized potting soil. Most potting mixes have very few of the nutrients that your plants require to grow and be healthy so you will need to add those nutrients to the soil or stimulate the ones already there if your mix is heavy on compost. There are many fertilizers to choose from but I use either an all-purpose, organic slow-release fertilizer or one designed especially for growing tomatoes or vegetables, which I mix into my potting soil. In addition, I use a diluted fish emulsion/seaweed liquid, once every week or two. I also sometimes add calcium, either in the form of lime or a liquid calcium. If you start seeing black at the ends of your tomatoes, you probably have blossom end rot, and that can be from watering issues and/or a lack of calcium in your soil. I disagree with conventional the wisdom here that recommends growing tomatoes with "patio," in their name. I think that most patio tomatoes taste, well, more like patio pavers than tomatoes. I love growing huge luscious tomatoes and sprawling cherry tomatoes. To me, tomatoes are all about taste and texture and I don't want to bother growing them if they aren't totally delicious. A lot of people swear by growing tomatoes upside-down. Not me. I have tried it several ways and haven't found any to be all that great. I see the point of growing tomatoes that hang - just not upside down. This is one of my chronic mistakes. I always forget how fast tomatoes grow and don't stake or cage them until they are huge and unwieldy. It is much better to set up your cages or stakes before your tomatoes get too big. Here is a video on how to build a bamboo tomato cage.